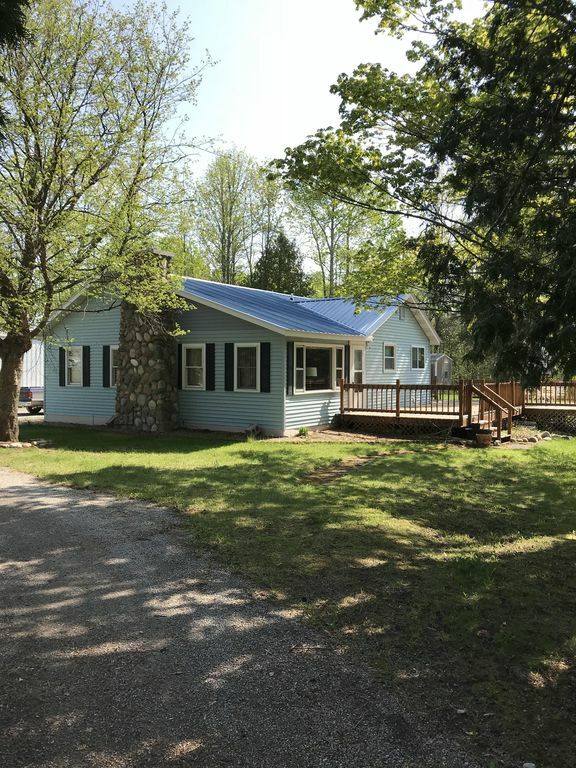 Quiet country home 1.5 miles from the beautiful Ocqueoc Falls and 2.5 miles from downtown Millersburg, located between Onaway and Rogers City. One hour drive to the Mackinac Bridge. Two bedrooms and two full bathrooms and laundry room have been completely remodeled in 2015. Large deck with patio set and bbq grill. Home has baseboard heat and gas logs in living room, with window a/c in living room. House is very clean. Indian Creek flows behind home. Quiet and peaceful setting. Property touches State Land. Next to the snowmobile trails. Perfectly comfortable get away! Very neat and clean. Enjoyed cozyiness! Well kept with an awesome lay-out. Very friendly accommodating owner. Everything was clean and sparkling. From the fresh fruit on the table to the crisp bedding and towels it was a great experience. We will definitely return!! Absolutely no problems! This home is wonderful. Very clean and well kept. Supplied with the necessary supplies to enjoy a great vacation. Beautiful deck and back yard to sit and relax. Lot of sightseeing opportunities close by. The owners go out of their way to make sure your stay is very enjoyable. I would highly recommend this house to anyone looking for a place to stay in this area. Beautiful house n place. Owners were very accomadating. Everything is as described n they even had a bowl of fruit n a newspaper on the table when we arrived. Cozy, clean, everything we needed! House exceeded expectations, Jeff was easy to contact & communicate with. All of us we're so happy with the thought and care that went into making our stay so lovely. Would love to go back sometime. From the moment you walk in you feel right at home. The hosts had fresh fruit and granola bars for us. They also had a wonderful Kuerig machine with excellent coffee and tea choices. The property was Super Clean and their attention to every detail makes you feel more than welcome. We loved the Jenga game and the corn hole too! Being 1.5 miles from the falls and the Oqueoc River was definitely a bonus! We went into Rogers City to visit family and Enjoy the Nautical Festival. Great Times!! We will be back for sure : ) Also check out the Bar in Millersburg for food. It was great! Loved the place and the location was perfect for my family! We are so happy that you enjoyed your stay and appreciated what our house has to offer. Thank you for keeping the house nice and clean, we look forward to you staying with us again in the future.